Do you wish you could improve your appearance and look younger? Cosmetic surgery is not the only option. Improving the appearance of your smile can make you look and feel better. At Adams Dental Associates, we work with our patients to come up with custom smile makeover plans to truly transform the smile. If you are in the Sacramento, CA area, call us at (916) 999-1302 for an appointment. Each smile makeover service starts with a consultation. During this appointment you will meet our team, discuss your concerns, and tells us what you would like your dream smile to look like. 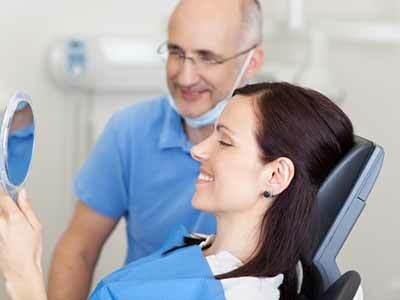 After an examination and discussion, we can come up with your individualized plan to a new smile. Some patients may only need one service to enhance the smile, while others may benefit from multiple services. A whiter, brighter smile instantly takes years off your appearance and improves the look of your entire face. We offer both in-office and at-home whitening services. Patients who want instant results may opt for in-office whitening, while those who are interested in gradual improvement may choose take-home trays. Dental crowns are beautiful, natural-looking caps that are placed over teeth to improve their appearance, strength, and function. They are designed to match neighboring teeth to blend in seamlessly within the smile. Crowns can be attached to a dental implant where the permanent tooth is missing, or they may be used on a tooth that has been damaged due to decay or trauma. Porcelain veneers are a multipurpose cosmetic solution that can conceal a wide variety of dental imperfections and last for many years. When attached to the front of teeth, veneers can hide cracks, chips, permanent staining, differing lengths, uneven spacing, and more. Porcelain is a strong ceramic material that is similar looking to tooth enamel, which makes veneers look natural. You don’t have to sit at home wishing you could improve your appearance. If you are in the Sacramento, CA area, call Adams Dental Associates to learn more about the services offered in our smile makeover programs. .